Here's a review I prepared earlier. 100% you need the tool, but your lbs might have it. @Cardy George What cranks are you using? If GXP I can drift the bearings out of my Slash Frame and send them on for you? Cheers for the offer, but it's running 100% XT gear, for now at least. Exactly, and the reason why I just want bearings. I'm not keen on stressing a carbon frame like that every 12 months. Quickest way to a flogged out hole. If it means upgrading to a threaded bb then who am I to argue? You've had the bike for how long now? 10 months, but the more telling number is 7,500km in fine dust. @Cardy George I think you just want to buy some 37x24x8mm bearings. Go grab some generics from the bearing store and slot them in. EDIT: They might be 37x24x7mm's, but just pop the verniers on them to confirm. Brake choices: Shimano xt 785 (I bought the merlin special) or a set of new magura MT5? I refuse to run dot. Serious question why the hate on dot all the time. It’s all I have used for years never an issue??? Seriously I can’t find why? Probably got burnt by avid/sram. I found I simply had o bleed them a lot more than mineral stuff. Also I did get the stuff on my bike once and freaked out about it for weeks wondering if the paint would start to bubble! Toxic, have to follow special disposal methods for the crap. Mineral oil, literally throw it on the garden and forget about it. Gets anywhere it shouldn't, spray some alcohol on it and wipe it away. Hydrophobic, buy 500mL and use all of it over a decade....or pour it on your garden, or let your kid drink. ... let your kid drink. Not the Shimano stuff though, that red colouring sends them bananas. Anyone got any good solutions for recalcitrant zippers? My hydration pack zips are starting to seize up a bit. Tried silicone spray on it ? But seriously, chuck it in the wash. If it works again then you just have some grit in there. If not the bits are probably bent a bit. Nope, but it's the obvious answer isn't it. I've also got some PFTE spray too. I'd heard of people rubbing candles on zips to lube them up. If all else fails, there's always KY.
Yeah, the PFTE spray works well too. @pink poodle You mentioned taking a screw out of the reservoir and dripping in my baby oil, which screw do I use, do I pump it or just drop in and seal. Cheers. Chapstick. I kid you not. @safreek shim bleeds are a piece of piss. As per that pic in the linked article, just take the while top cap off (after making the reservoir level!) so 2 bolts on the old models. 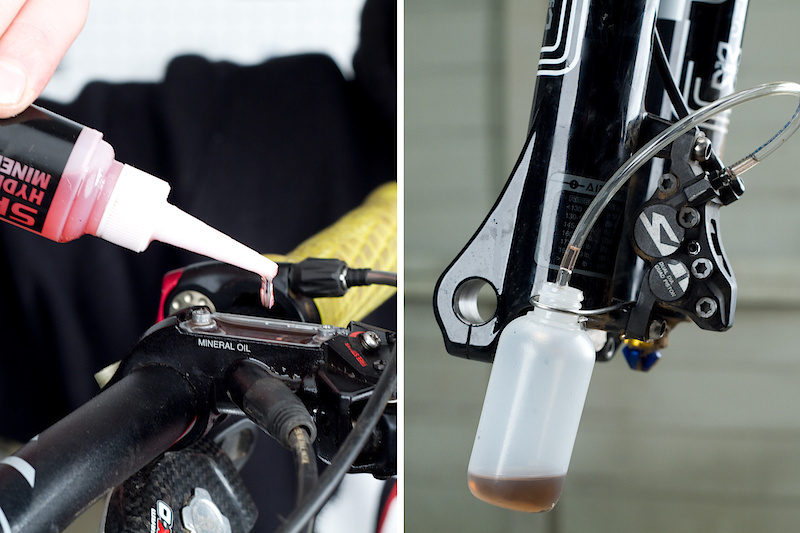 You can just fill up the reservoir, pump the lever, repeat until brake feels firm and then seal it up. You don't need to do the whole process of you just want a quick solution.